I haven’t seen Season 4. I have not even read any fan reviews, though a friend did tell me she was underwhelmed and confirmed two of my guesses as to what happened in episode 1. I do have a recording of the episode, but I’ve not been inclined to watch it given the condition of the world right now (including the Brexit and U.S. election votes). I suspect this will be the last season until Freeman and Cumberbatch decide they need the money and some suit at BBC wises up. Though by then, there will probably not be a PBS broadcasting in the U.S. any longer and any corporate suit who is looking for a surefire nostalgia success will want to reboot with younger actors. You’d think Moftiss would realize that what people really want is the Hope that the original Sherlock Holmes stories brought, that smart, good individuals did exist, cared, and could bring about justice for even the poor. We can already see the stupid, cruel, and rich crushing the middle- and poorer-classes while making an obscene gesture to the altruistic and enlightened concepts like “Truth, Justice and the American Way”, as the old Superman TV series put it. Though, in fact, it was also the British Way first. Yes, I am depressed and despondent over the political and social climate, and the descent of Sherlock into soap opera Shock schlock. In our unenlightened, racing-to-the-Dark-Ages, post-fact, (i.e. stupid and ignorant) society we’ve also devolved into a brutish, cloddish, crude, rude, adolescent male, post-taste culture, if it can be called “culture” except in the social science sense. This entry was posted in News, Speculations and tagged bbc sherlock, Mofftiss, Season 4 on January 11, 2017 by JH Watson. Who told you my Twitter Handle was Captain Jack? 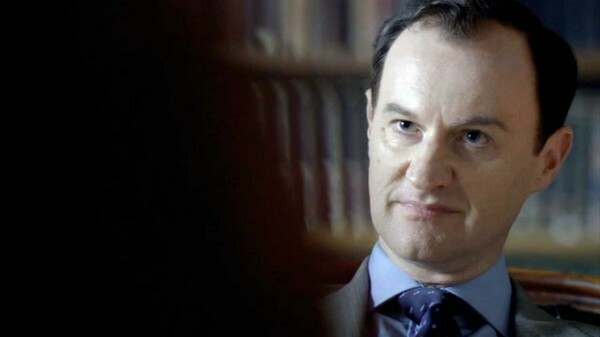 Your secret is out, Mycroft! Oh, come on, you’d love to see Mofftiss do this before the series ends, admit it. This entry was posted in Captions and tagged bbc sherlock, Mark Gatiss, Mofftiss, Mycroft Holmes, photo caption, tv series on September 13, 2012 by JH Watson. Maybe I was a little hasty with The Final Solution. Is it too late to change the script so I don’t actually die? Sorry, but Andrew Scott let it out at the television conference that Moriarty is indeed dead (well, I could have told everyone that) much to the wails of a segment of Sherlock fans. It also came out that the reason Moriarty was included to begin with was that a bit of research by Mofftiss discovered that the one character all of the fans wanted to see in a Sherlock Holmes series was Moriarty. All of this was a surprised to Moffat who pointed out that Moriarty was on only in one story. But look at how many times he appears in the movies and pastiche pieces, Mr. Moffat! It also came out that the entire bit at the end was added to the revised script because they came up with it for the audition since the only thing planned at that point was the “Gay Jim” bit. After Scott finished chewing the scenery, spitting it out, and flossing his teeth with Semtex, Mofftiss ordered some changes to The Great Game — and then had to work their way out of it. 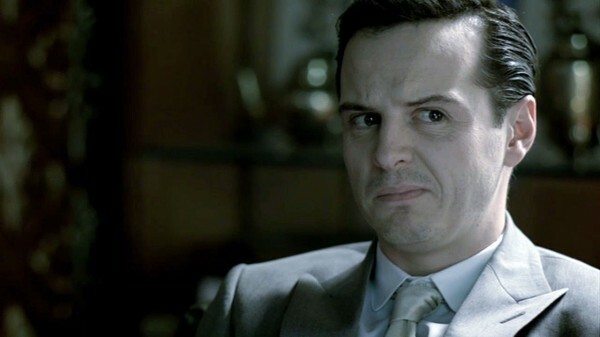 Frankly, I feel Andrew Scott was the Best Moriarty Ever — and I grew up with all of the classic ones. The problem with the other Moriarties (is that the plural for Moriarty?) is that they were always so stuffy and pompous, which did fit in with the Victorian/Edwardian Canon, but the part missed is that he was a total psychopath. Andrew Scott’s rendition is a fabulous bat-sh** crazy psychopath (sort of the very bizarre offspring of Johnny Depp’s Hunter S. Thomson and Anthony Hopkin’s Hannibal Lecter). And the amazing thing is that Mr. Scott seems like such a nice guy in the interviews. This entry was posted in Captions, Speculations and tagged Andrew Scott, bbc sherlock, Mofftiss, Moriarty, tv series on September 3, 2012 by JH Watson. Rat. Wedding. Bow. A very clever game to keep the fans, and me, from getting bored, Mofftiss, but I’ll figure it out. This entry was posted in Captions and tagged Andrew Scott, bbc sherlock, benedict cumberbatch, Mofftiss, Sherlock Holmes, tv series on September 1, 2012 by JH Watson. Well, the Baker Street Babes, among others, have posted the hint that Mark Gatiss and company gave about Season 3 Sherlock. I’m not certain it actually helps reduce the pain (especially since there are awful rumours that the first episode won’t air until FALL 2013). 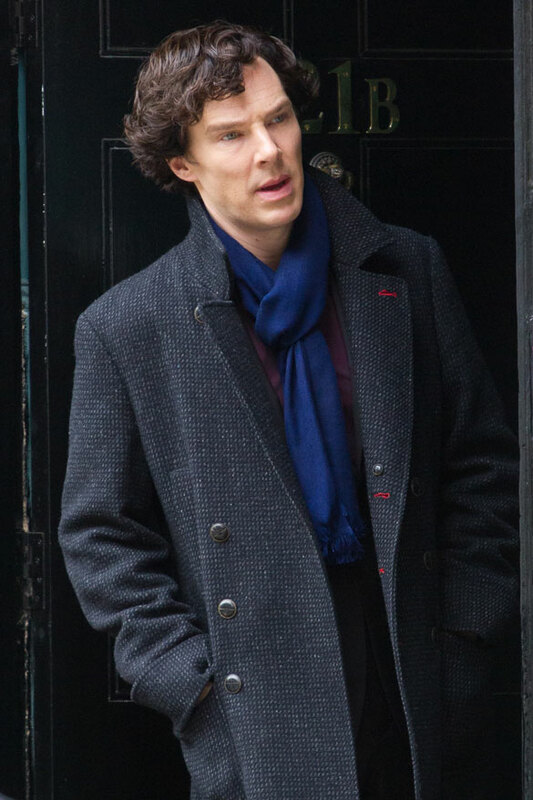 Follow the link to the Baker Street Babes Tumblr post. Or this one to their true home on Blogger. There’s also a nice piece on the hints at Radio Times. There are a number of possible stories that could apply. We know that The Empty House has to be a part of the first episode and Moran was certainly a rat, however, there is always the untold case of the Giant Rat of Sumatra and, of course, the reference in The Boscombe Valley Mystery. Chances are good that we’ll get a first episode that makes reference to more than one Holmes story. The Solitary Cyclist which has lots of heroic action and a plucky, but poor heroine and is bit Victorian for my taste but I know many Sherlockians love it. and she asks Sherlock to walk her down the aisle since her dad is dead…hmmm? Now calm down everyone. We’ll proceed in a calm and orderly fashion. Remember, Keep Calm and Believe in Sherlock Holmes. Yes, yes, the first thought is His Last Bow where Sherlock retires, but keep in mind a) that there were stories written and published afterwards that took place before Last Bow and b) the word has many meanings in English. It also has multiple pronunciations, although the report is that it was said like the bow of a ship or the bow after a performance. And yes, it’s true, that while Cumberbatch and the rest have said they would love to keep doing Sherlock they are all very hot commodities right now with very lucrative and creatively satisfying offers. Well, I’m off to do more research in the Canon (and drink some camomile tea to calm down). You do realize that Mofftiss did this to torture us because they are such awful sadists, don’t you? This entry was posted in Other, Speculations and tagged Arthur Conan Doyle, bbc sherlock, benedict cumberbatch, Mark Gatiss, Mofftiss, Season 3, Steven Moffat, tv series on August 24, 2012 by JH Watson. What do you mean you got married? 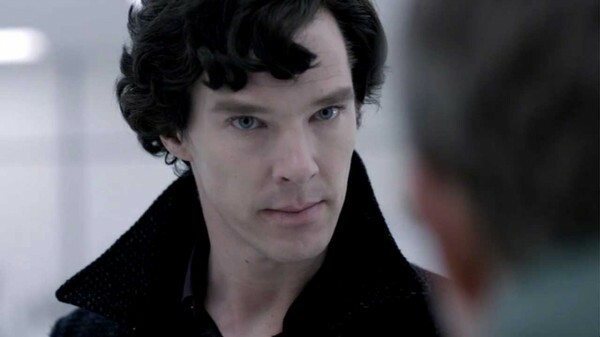 Let’s face it, Sherlock, you’d make a terrible best man. So John would have to ask Lestrade and then you’d get all pissy and ruin the reception if not the wedding (although it would certainly be fun for all if you were drugged and joined in on Thriller…). I went back and re-re-read the stories and sure enough, John has a very fast courtship and a rather brief marriage and, like a good Victorian wife in so many stories, she dies as soon as she becomes inconvenient. 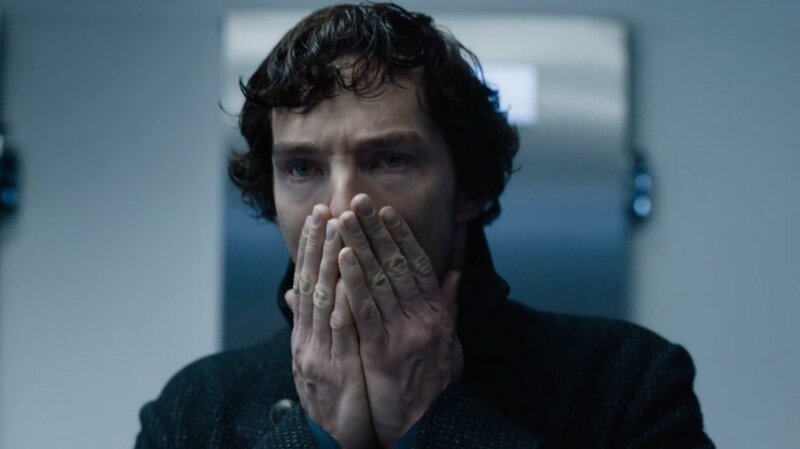 So either Mofftiss and company are dropping Mary entirely from their series or she might be making her entire appearance off-camera in the intervening period before Sherlock returns. 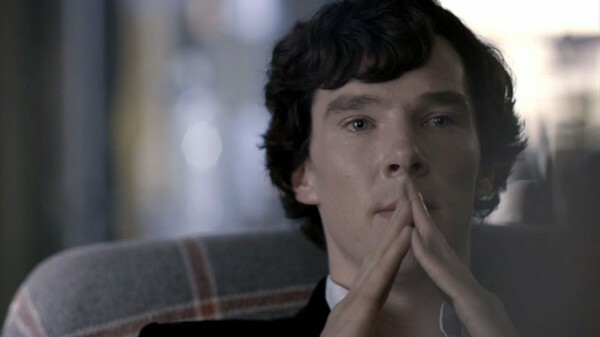 Personally, I’d love to see Sherlock’s reaction to John explaining that he’d gotten married. Of course, the fanfic writers have been having Sherlock hook up with Irene Adler in the intervening period and producing a little Hamish in tow, so I suppose it’s only fair for John to get some downtime action — and at least he knows to use protection… The really scary fanfic have Moriarty reproducing (usually with Adler). This entry was posted in Captions, Speculations and tagged bbc sherlock, benedict cumberbatch, Mofftiss, photo caption, Sherlock Holmes, tv series on August 18, 2012 by JH Watson.